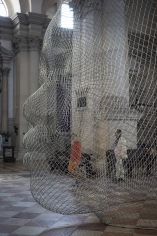 On the occasion of the 56th Venice Biennale, one of Venice’s most celebrated landmarks, the Basilica of San Giorgio Maggiore, will host Together, a major exhibition of new works by Spanish artist Jaume Plensa. 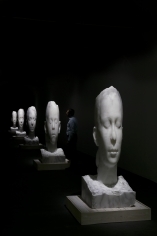 Plensa (Spain, b.1955) is one of the world’s foremost artists working in the public art space, with permanent works spanning the globe including the Crown Fountain (Chicago), Echo (Seattle), Breathing (London) and Roots (Tokyo). 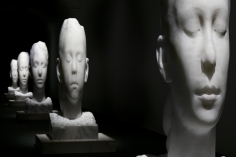 The exhibition is curated by Clare Lilley, Director of Programme at the Yorkshire Sculpture Park. For four hundred years the Basilica of San Giorgio Maggiore has been a place of worship, communication and meditation, where Palladio’s architecture creates a profound, contemplative environment. 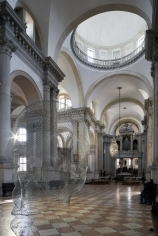 Plensa’s response to this powerful space is Together; a conversation between two sculptures which set up a line of spiritual and intellectual discourse on the dominant west-east axis of the building; a hand composed from the characters of eight alphabets is suspended beneath the cupola, whilst a large-scale head, created from stainless steel mesh, is sited in the nave. The works in the exhibition all make their debut in San Giorgio and reflect the artist’s continued interest in a bodily relationship to space, scale, material and place. An installation of meticulous drawings and a group of luminous alabaster portraits continues in the adjacent Manica Lunga building, located 300 meters from the entrance to the Basilica on the island’s northern edge. are testament to his acute understanding of space and scale. 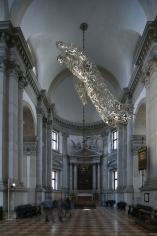 His sculptures do not impose themselves on these historic spaces; rather they capture and reflect the actual light and shadows within to communicate a metaphorical language. 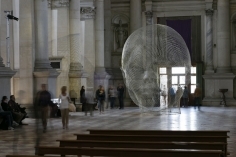 Both visually stunning and intimate, they draw our attention to a world where migration and difference challenge civilised behaviour; in this place, which for centuries has welcomed world travellers, Plensa’s work will connect people of many faiths and of no faith. 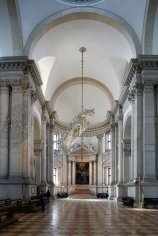 In collaboration with the monks of the Abbazia di San Giorgio, as part of the cultural activities of the Benedicti Claustra Onlus, Together hopes to advance the Benedictine community’s efforts to develop a number of restoration projects of the monumental Palladian complex on San Giorgio Maggiore. Inspired by textual elements in the body of Plensa’s work, the project has contributed a significant donation to restore the Abbazia’s 15th and 16th Century illuminated manuscripts; prayer books previously too delicate for public view. 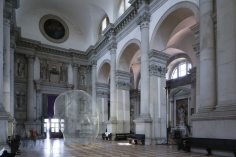 Dr. Carmelo Grasso, head of the Benedicti Claustra Onlus explains: During the Plensa exhibition an 'Illuminated choral' of San Giorgio Maggiore Abbey, liturgical instrument of prayer and spiritual dialogue used by the monks for centuries for the daily Opus Dei and community prayer, will be placed on the lectern of badalone's choir behind the main altar. This is the contribution of the Benedictine Community to strengthen the sense of togetherness and the intellectual and spiritual dialogue between the hand, the head and those who wish to enter into a relationship with the artist's work and the great Palladian Basilica.